In our body, the Cell Cycle (Cell Division Cycle) is an ordered sequence of events, culminating in cell growth and cell division into two daughter cells, regulated by temporal activation of cyclin-dependent kinases (CDKs). In our body, the Non-dividing cells are not considered to be in the cell cycle. In our body's cells, Cell Cycle Checkpoints are regulatory signaling systems that control the progression through the cell cycle. In our body's cells, Interphase is the period in the body between two successive cell divisions when growth and replacement occur in preparation for the next division; consisting of gap 1 (G1), synthesis (S), and gap 2 (G2). In our body's cells, during Interphase the cell's chromosomes are not individually distinguishable. In our body's cells, Anaphase is the phase of mitosis in which the chromosomes begin to separate. The paired chromosomes separate at the kinetochores and move to opposite sides of the cell. Motion results from a combination of kinetochore movement along the spindle microtubules and through the physical interaction of polar microtubules. In our body's cells, Anaphase the phase of cell nucleus division following Metaphase, in which the chromatids separate and migrate to opposite poles of the spindle. In our body's cells, Mitotic Spindle Apparatus is an organelle consisting of astral microtubules, polar microtubules and kinetochore microtubules. 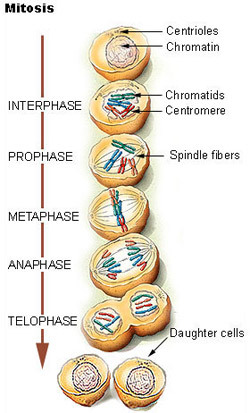 In our body's cells, the mitotic spindle is a bipolar array of microtubules (MTs) required for the symmetrical distribution of chromosomes to each daughter cell. The process of bipolar spindle formation is controlled by both the centrosome-mediated pathway and chromatin-mediated pathway. Whereas the minus ends of spindle MTs cluster together at the spindle poles, their plus ends grow toward the cell equator and capture the kinetochores. The Mitotic Spindle Apparatus is a network of microtubules formed during prophase, some of the microtubules attach to the centromeres of the chromosomes which help draw the chromosomes apart during anaphase. Kinetochore microtubules, which connect the centromeres of the various chromosomes to either centrosome. In our body's cells, the self-replicating Centrioles are a paired cellular, short, fibrous, rod-shaped organelles, which function in the organization of the mitotic spindle during cell division. The Centrioles distal appendages are involved in the docking and anchoring of the mother centriole to the cellular membrane during ciliogenesis. In our body's cells, Crossing-Over happens during the first meiotic prophase, a process in which part of a chromatid is physically exchanged with another chromatid to form chromosomes with a new allele combination. In our body's cells, Metaphase is the stage of our cell division (mitosis or meiosis) in which the chromosomes line up at the equator of the cell. In our body, Cyclin are a large family of regulatory proteins that function as accessory subunits to a variety of cyclin-dependent kinase enzymes, generally function as enzyme activators that drive the cell cycle through transitions between phases, and some may also function as transcriptional regulators. In our body, Cyclin is a cell cycle protein found in our dividing cells that acts as a control during cell division by activating cyclin-dependent kinase enzymes (Cdk enzymes), the concentration of which varies in a cyclical fashion during the cell cycle, being produced or degraded as needed in order to drive the cell through the different stages of the cell cycle. In our body's cells, Mitosis is the type of cell nucleus division (cell nuclear division) plus cytokinesis, that produces two identical daughter cells during prophase, prometaphase, metaphase, anaphase, and telophase. In our body's cells, Mitosis occurs between G2 and G1, in which the DNA of the cell is replicated during interphase of the cell cycle and then segregated during the four phases of mitosis.